This is a list of the mammal species recorded in Montserrat. These are the mammal species in Montserrat, of which 0 are critically endangered, 1 is endangered, 1 is vulnerable, and 0 are near-threatened. One species is considered extinct. 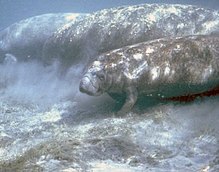 Sirenia is an order of fully aquatic, herbivorous mammals that inhabit rivers, estuaries, coastal marine waters, swamps, and marine wetlands. All four species are endangered.